Before I visited Europe for the first time as an undergraduate, I never thought about churches having an emotional impact. 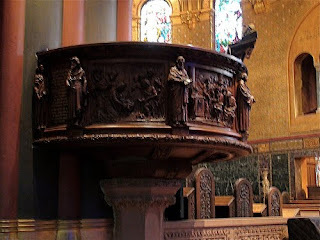 My home parish was, as my father used to describe it, nothing more than “a big cracker box,” rectangular in shape with mass-produced statues of saints for decoration. Seeing the architecture of Romanesque and Gothic cathedrals—with their never-to-be-reproduced stained glass windows and beautiful iconography inside and out—made me examine religious buildings in a whole new light. While there are some outstanding places of worship in this country, none that I’ve seen so far have touched me more than the historic landmark I visited this week: Boston’s Trinity Church. 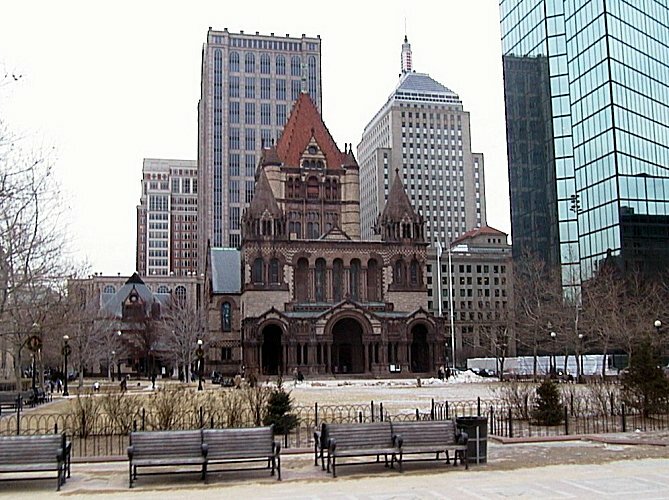 The current incarnation of this Episcopal church has been situated in Copley Square since 1877. 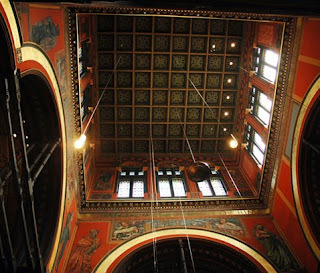 Five years earlier architect Henry Hobson Richardson won a competition to design the structure. The feat of supporting the massive stone building on the landfill of Back Bay (which was once marshland) required the installation of 4 giant granite pyramids and 4500 cedar pilings; interestingly enough, the wood must to this day remain irrigated so as not to rot away. The exterior, a lovely mix of porches, arches, turrets, and windows of contrasting beige granite and red sandstone, was gleaned by the architect from his knowledge of French and Spanish architecture. The reflection of the church in the glass of the neighboring John Hancock Tower serves to highlight its intricacies and beauty. This unusual style, now known as Richardson Romanesque or Romanesque Revival, has apparently been copied by architects in Canada (for the Château Frontenac, among other buildings) and in Europe. The interior is no less amazing…and I do not use the word lightly. This is no austere, somber, merely functional church. Upon entering, your eyes immediately lift to the striking, deep red background of the murals on the front walls and you realize that you are in a remarkable place. 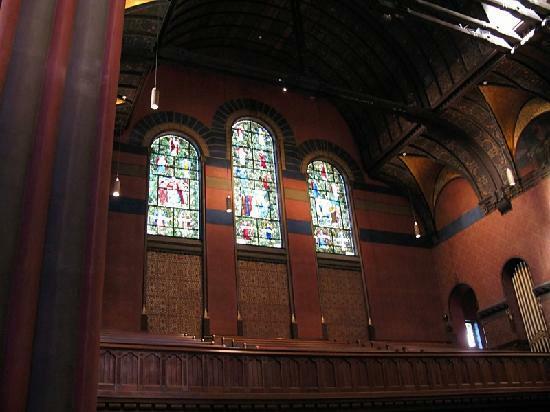 Then you glance down at the warm gold colors and stained glass windows which adorn the sanctuary. Literally everywhere you look there are outstanding architectural and decorative elements. 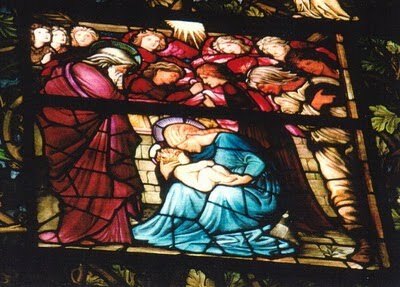 There is the luminous cupola, the beautifully carved wooden pulpit, and the impressive array of stained glass windows—like the lovely Worship of the Shepherds created by British Pre-Raphaelite artist Edward Burne-Jones in 1882. This place of worship truly seems sacred and makes you want to sit quietly and contemplate the stunning surroundings. Its pictures do not do it justice. 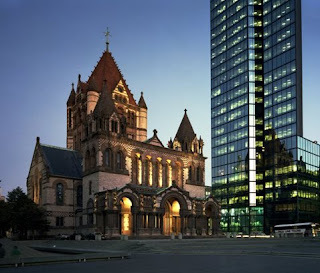 Guided and self-guided tours are available every day at Trinity Church. It is definitely worth the $6.00 entry fee. Richardson’s design of Albany’s city hall and his collaboration on the New York State Capitol give me additional places to visit in 2011. Have an inspirational new year!